The Kamm Teapot Foundation is a private, non-profit, charitable trust that maintains an extensive teapot collection for its eventual public use in a museum setting. The collection numbers over 17,000 items and encompasses historical decorative arts, industrial design icons, unique works of contemporary art, novelty teapots, and teapot-related artifacts. 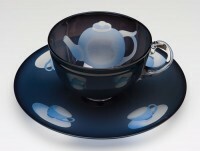 This blog will showcase the collection and illuminate the teapots and the ideas behind them.